The 2013 summer movie season finally kicks off this weekend as Robert Downey, Jr. and Marvel bring Tony Stark back to the big screen for the fourth time since 2008 in Iron Man 3. This will also mark the seventh consecutive year that a Marvel franchise has opened the first week of May (dating back to 2007's Spider-Man 3). - Last year's phenomenal success of The Avengers could help to reignite and/or expand interest in the solo Iron Man series. - Adding 3D to its arsenal, this sequel should be able to comfortably outperform Iron Man 2's $128.1 million opening on the same weekend three years ago. - The lack of competition in the early 2013 market combined with a huge location count will ensure strong upfront demand. - Will the inclusion of 10pm Thursday shows be a significant benefit to the overall weekend revenue? - Early reviews and online reactions from overseas audiences have been solid. Could social media and Avengers' own success help win back general audiences lost with Iron Man 2? - The film has consistently trended strongly on Twitter and Facebook. - The Avengers aside, general reception of Iron Man 2 was less than stellar in 2010 and resulted in modest legs for a blockbuster despite minimal competition that May. - Given the amount of competition the film faces after opening weekend this time around, more importance will be placed on the strength of the debut. - The Avengers offered a unique premise and expanded interest from kids and adults alike with its collection of superheroes. 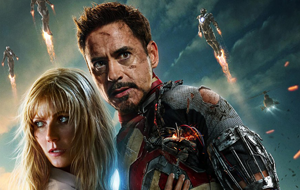 Iron Man 3 is in new territory as the first return to the Marvel universe's solo films. - Pre-sales have been strong, but not necessarily record-breaking. Check out our forecast for Iron Man 3 and the remainder of the weekend's top 10 in the table below.